April 15, 2015. Only Blick could have pulled this together. The Oakley Legends Ride. 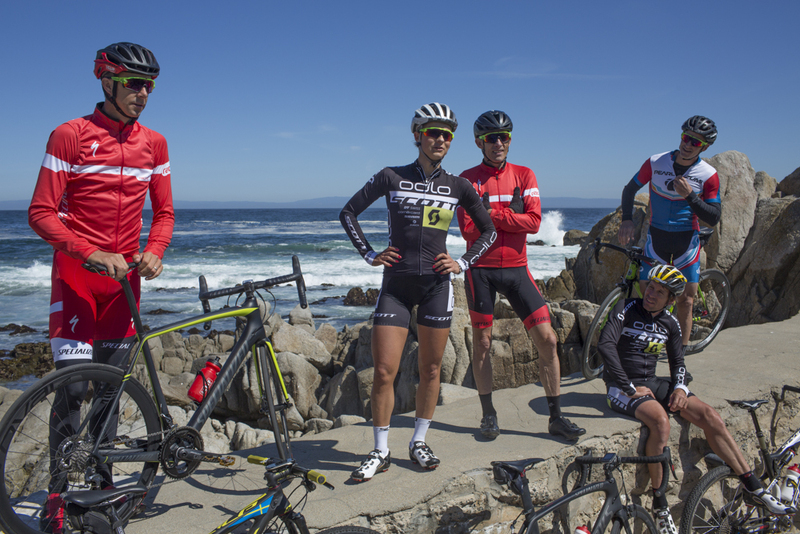 Ned Overend, Thomas “Frischi” Frischknecht, Todd Wells, Brian Lopes, and newcomer Jenny Rissveds. There were two common points that brought all of these athletes together on April 15 in Montery, CA. The first being that they’re Oakley sponsored athletes. Oakley put this ride together. The second is that they love to ride their bikes. Oakley was launching it’s new model called the “Jawbreaker” The Jawbreaker is one part revamped Eyeshade, one part oversized Jawbone - err - Racing Jacket. We met up at Peet’s coffee. Blick loves Peets. Ned showed up first, followed by Frischi and Jenny and then Lopes and Wells. Lopes and Wells used to be friends and teammates at GT, so they got to catch up. 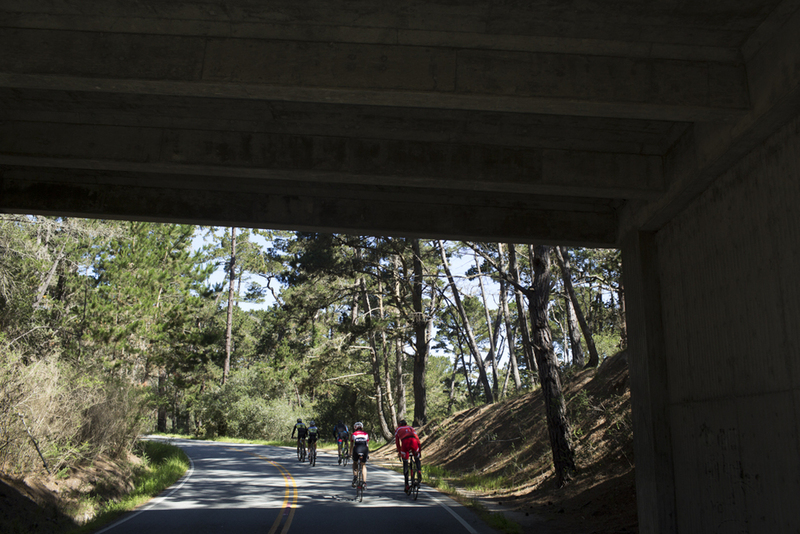 The route was to be 17-mile Drive in Monterey. It’s a nice, scenic winding road that skirts the ocean before climbing into the trees. I expected the pace to be social, which it was, but of course a bunch of still-competitive old dudes are going to give what they’ve got and Jenny was training, so of course the throttle just kept twisting further - almost imperceptibly. At some point Blick attacked on a climb, but didn’t make it stick. Hill kept going, Blick faded back. All in good fun. Osprey makes every variation of pack to satisfy your every possible desire in terms of how you like to organize your gear. The Manta 28 is not their lightest pack, (it comes in at 2lbs. 5 oz. while the Tempest 22 and Escapist 20 come in at 1 lb. 10 oz.) but what you gain is features and improved compartmentalization. It also has the magnetic holder for your bite valve, a more functional zippered hip belt pocket, and a mesh back panel that keeps the pack off your back, allowing for airflow between you and the pack. 2. Heart coffee - Colombia La Primavera - $19 for 12 oz. Apparently the Colombian coffee is what you should be drinking right now, that is if you care about “fresh” coffee. Heart goes to great lengths to work closely with growers and source high quality beans. La Primavera comes highly recommended. From the OSMO site: “When you exercise, you stress your body. During recovery you adapt to those stresses, getting stronger and more efficient. Osmo Acute Recovery is the result of over ten years of Dr. Stacy Sims' lab and field research with elite athletes to: Speed Recovery, Optimize Training Adaptions, Rapidly Restore Glycogen. Osmo uses only the highest quality natural ingredients like organic vanilla because putting the best in your body is the only way to get the best out of it.” I can only tell you that I've been using their recovery for a couple of years now and it works! “Olympic medalists, Tour de France riders, and pro triathletes know hydration is critical to top performance. That's why they've replaced their sponsors' drinks with Dr. Stacy Sims’ hydration formulas for years. Osmo Active brings the benefits of Stacy's hydration science to everyone. Increase Power Output, Improve Endurance, Reduce Cramping. Osmo Active has been developed to maximize the rate of fluid absorption into the body and uses only the highest quality natural ingredients - like organic fruit.” Again, I can't explain the science…I'll leave that to Stacy, she actually did the research. I'll just keep using it, because it works! “Trail Butter is a delicious, all-natural nut-butter, designed to provide lasting energy and nutrition to outdoor enthusiasts and home consumers alike, through the use of supplemental whole- food ingredients. Using a triple nut blend of almonds, peanuts and hazelnuts as the foundation, dried fruits, seeds, nectar and honey and oils are added to create a tasty mixture fortified only with nature’s most energy packed foods.” Made in Portland, Oregon and now available in a portable 4.5 oz. pouch. Trail butter is real food for your next adventure! Oh, and it really adds wonderful flavor to my morning oatmeal as well. I'm hooked. While not as convenient as the pouch, the 8 oz. jar is the best deal going. Snowpeak makes high quality titanium cookware. I've gravitated to this size since its large enough to boil the water I need for breakfast and dinner, and small enough that it won't get damaged in a seat bag. This is my go-to pot. Also the 450 cup and a Trangia stove fit perfectly inside. Highly recommended. Some will debate single wall vs. double wall on these 450 cups. For weight savings, I'm voting for the single wall. If you don't care about carrying extra weight get the double wall. For an extra $6 you can get green, pink, or blue anodized. I'm backing the classic Ti, but that's just me. Unless you've been hiding under a rock and ignoring all social media, you've heard of The Athletic. Jeremy and Julie have turned their Instagram success into a wildly successful business. It all started with the PDX airport carpet design sock, and now their dedicated site has at least 13 different sock designs in every possible color to match your kit. They just opened a brick and mortar storefront in NW Portland. Go pay them a visit. For winter it's all about the wool socks and black and white scheme, so I'm loving the Julie K collection which comes with 2 bidons (bottles) a casquette (cap), a pair of socks, and 3 sketchbooks. For runners they have a full line of shirts and shorts too. Those are flying off the racks. Get over there quick! Switching from standard sealant to Orange Seal Sealant lets us focus on the trail, scenery and navigation rather than worrying about flats. The secret ingredient is what Orange Seal calls “nanites” and should plug holes up to 1/4". Next level stuff. Digital scales serve multiple functions. First, weigh your kit and decide how much weight you're willing/able to carry. Second, make your own food. Coffee snob? You better measure out that 18 grams for your aeropress. The Feedback is reliable and easy to use. 3. Heart Coffee - Colombia Buesaco - $20 for 12 oz. Heart cares about quality beans. It costs a bit more, but you get what you pay for, and Heart is making the trips to Colombia to establish the relationships with the growers. They're buying relatively small batches and roasting them for freshness. Added bonus: you can buy directly from their website. Keep an eye on new varieties, since they change weekly, even daily. Spot's GPS messengers are peace of mind, for both the rider heading out into the backcountry as well as your loved ones at home. If you haven't followed a race, like the AZTR or the Tour Divide. The reason you're able to follow the blue dot online is the Spot tracker. The rider is able to send “all OK” messages and your people at home can track your progress online. Super cool! And if everything goes wrong and you can't get yourself out, help is a button push away. The hardware cost is only the first investment, service is the real cost, but the Spot is essential, so just get one already. Metallic Black with Ruby Iridium. I'm pretty sure Frogskins were the first pair of shades that I just HAD to have. They were clear with metallic blue lenses. They were so rad. Still are. We're going to give Frogskins the nod for bikepacking as well, since they're lightweight, durable and give you that all important “normal person” look when you stop back in civilization and you're less likely to be called “Lance Armstrong” by the locals. I counted about 30 different frame and lens combinations on the Oakley site, so the odds are good that you can find your unique flavor. The U.L. stands for - you guessed it - ultralight. 7.6 oz. to be exact. It's not even their lightest down jacket, but this one struck the best balance of price and features for me. For example, their Plasma 1000 comes in at 4.8 oz. but it's $269 and for that price you don't get pockets. Packability is the other benefit. Come winter, there's no reason to leave home without one of these in your pack. One of my favorite albums. Upbeat, cosmic, grooving, inspired. I'm not even a huge jazz fan, but this is one of those that transcends genre, and one worth buying on vinyl. Luckily for you it was reissued in 2013. More importantly, go buy the people you love some vinyl. It's still sounds the best and if you love an album enough, owning it on vinyl is the ultimate - you get to enjoy the cover art at full scale and it just feels right. The more I listen to itunes or Spotify, the more I want to enjoy music the way it was intended, with soul, and a bit of imperfection. Besides a gift guide with just gear is a bit boring. I've been using the Rapha Rain Jacket for the last four years, maybe longer. It has kept me surprisingly dry on everything from soaking training rides to drizzly bikepacking in Alaska. Rapha has upgraded it this year with sealed seams and a hot blaze orange colorway that will keep you seen by both cars and hunters. Hi viz is not a fashion statement, it's survival. The cut is trim for cycling, but you should have no problem layering it over a base layer and wool jersey. This site has been a long time coming. I've gotten to a point where I felt like I was hoarding valuable information and stories and didn't feel like I had a good way to share my adventures. The occasional Instagram post and a small flurry of 'likes' left me unsatisfied. I had just started shooting for Privateer–Rouleur's mountain bike magazine–right before they folded. Apparently it's a tough time for beautiful, expensive print magazines. Shame about that. That's what I want this site to be about. A sense of wonder, going out and seeking your deepest dreams…exploring. But we don't cultivate danger or try to get lost in the woods–that's neither fun nor responsible. I'm all about learning the necessary skills and slowly, with proper preparation and a pack full of the right gear, taking bigger and bigger steps. We want to ride new trails with good folks. We want to take our time and eat good food. We want to do big miles when it makes sense. We want to explore new roads and trails and come home to tell you all about it. So my goal is for this site to be a bit of a trail magic. I'll share what I learn out on the trail. I don't claim to be an expert at bikepacking by any means, so take all of this for what it is–one person's journal–it's just information and ideas, another source of knowledge. But I really don't want this to be all about me. The site has a section called “profiles” where I'm going out and talking to the people that have been doing things that inspire me…race promoters, men and women doing long routes, making incredible food, and asking them 11 questions and sharing the results with you. We're passionate about nutrition and food, so we'll share the art and science of what works on the bike. I guess I've done just enough long distance cycling to know that “fast and light” is the way (for me), to carry just enough gear, not for every eventuality, but I think that you can ride more trail and have more fun if you're not burdened with unnecessary weight. I also come from a bit of a racing background…having dabbled in mountain bike racing both recently and when I started in the late 80's and early 90's, and more recently cyclocross and a bit of road. I appreciate a nice bike and going fast and I do like to push myself a bit. So, with that in mind we've teamed up with some fantastic companies. We've approached brands that make products that work for what we want to do. First in this mix is Seven Cycles, makers of fine custom titanium steeds. 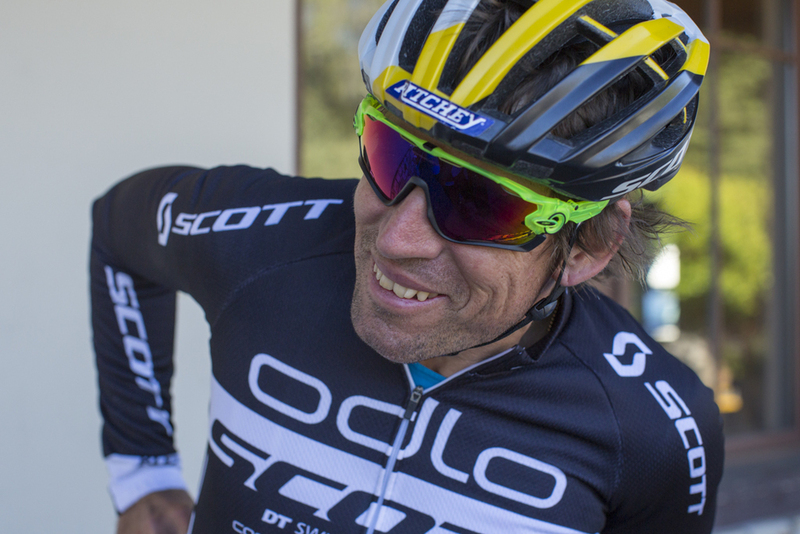 We've also teamed up with OSMO Nutrition for hydration and recovery. Their product is all natural and I really believe they are the next wave for hydration. Osprey Packs are undisputed leaders for lightweight packs that work for mountain biking and bikepacking, so we're happy to have them in the mix. Snowpeak is a Japanese company that has offices in Portland, OR. We're very pleased to be using their titanium cookware. Thanks for joining us and we hope you enjoy the ride.